Have you done your Medical Check Up? Last weekend I have participated in HSC World Health Day 2018 in conjunction of World health Day 2018. Array of program and activities has been arranged by HSC Medical Centre. The slogan for that day is " A Fun Day For The Whole Family". HSC World Health Day 2018 has received impressive response from the public that care about their health. 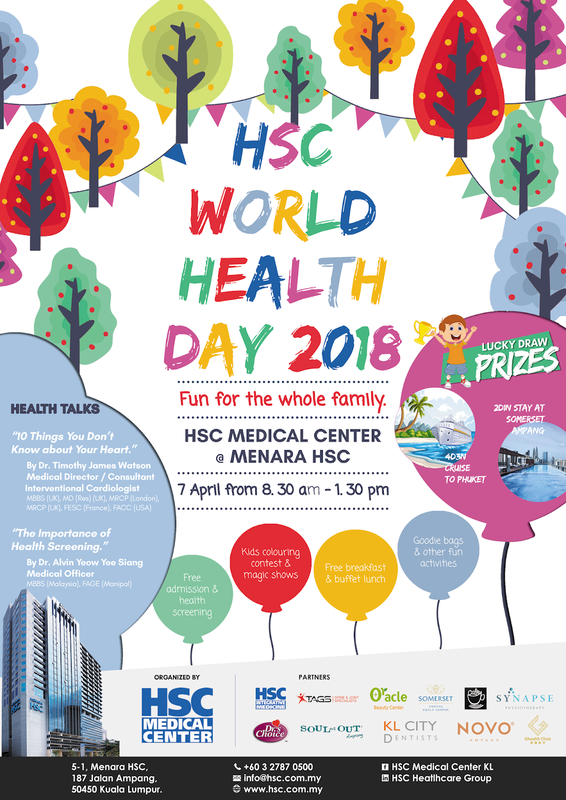 HSC World Health Day 2018 is a fun-filled family and health fair organized by HSC Medical Center, Asia’s pioneer in heart, stroke and cancer with exciting family activities for both parents and children alike. The public/guests are required to register at ground floor upon arrived at Menara HSC. Each of the participants will be given a t-shirts and stamping card. HSC World Health Day 2018 is opened to all members of the publics with the aim to be a fun day for the whole family focusing on health and wellbeing. The event is also extended to HSC Medical Center’s patients, clients, partners as well as Menara HSC’s tenants. Start your morning with health screening whereby they offer Free Blood Pressure check out, Glucose Level test and Free Body Max index. A good beginning for the public that participate for the health screening as they get to know their body condition. My blood pressure and glucose level reading is good but I need to cut down my weight as my body fat is obese. Oppsss. The Zumba fitness started at 8.45 am at Level 3, Menara HSC. Surprisingly the response was good from the crowd and everyone enjoy the sweating moment. HSC World Health Day 2018 is officiate by Mr. Derrick Chan, Group Chief Officer of HSC Healthcare Group. The event carried on with health talk regarding 10 Things You Don't Know About Your Heart by Dr. Timothy James Watson. Dr. Timothy is Medical Director / Senior Consultant Interventional Cardiologist. During Dr. Timothy speech, he explained why a healthy heart is important. Our heart is our main organ in our body. Our living lifestyle indirectly influence our heart condition. Definitely Malaysia is rich with nice food such as Nasi Lemak, Rendang and etc. But do you know, if we consume unhealthy food regular, it actually will clog the artery? Do you know smoking and consume alcohol also will effect our heart. Which to know more about your heart condition? Make appointment with Dr. Timothy for consultation. The second speaker is Dr. Alvin Yeow Yee Siang, Medical Officer at HSC Medical Center. Dr. Alvin shared with the audience The Importance of Health Screening. When is your last health screening? Our health is our responsible and we need to do health screening at least once a year. Book your appointment now for health screening as HSC Medical Center offers reasonable package for Health Screening. Thank you to Dr. Timothy and Dr. Alvin for the impressive talk. I enjoy the topic presented on that day. The health talk basically is to create awareness to the public to be more cautious about their health. Early detection of your health condition can actually save our life. The activities continue with HSC World Health Day 2018 Stamp Hunting whereby public need to get stamping from participant partners such as Oracle, Tags, Synapse, Klinik Ghealth, KL City Dentists, Souled Out, Somerset Hotel, Novo Ampang, Café and Drs Choice. Upon completion the stamp hunting, public are entitle for amazing lucky draw. Beside health talk and stamp hunting, public also can participate for the blood donation, kids coloring contest and comedy show. New Menu: Around the World with SOULed OUT!